This very efficient brushles motor with neodymium magnets and a rotating case is manufactured using the latest technology from the finest quality materials. The hardened steel 8mm shaft is supported by three ball bearings, and the overall robust construction ensures a long service life. Due to it’s high torque characteristics this motor is capable of turning large propellers with a high level of efficiency, and without the need for a gearbox. This motor has been designed especially for wide spread high current 6s lipols packs of capacity from 4000mAh to 5500mAh. 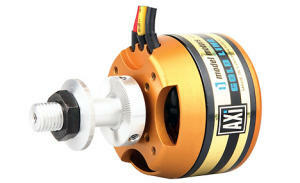 AXI 5320/18 GOLD LINE together with 6s lipols is capable to reach currents up to 80A shortly and is suitable for 3D models weighing up to 4300g and sports aerobatic models up to 5500g. 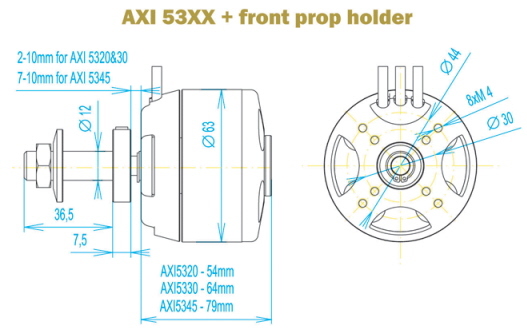 The lack of gearbox noise makes these motors particularly suitable for scale models. 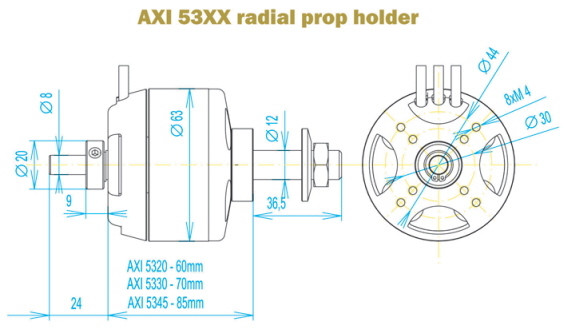 AXI53xx motors offer front and reverse (radial) mounting options, and two prop adapters for both mounting options are included as standard.